These requirements are intended to evaluate the length of time that these types of assemblies will contain a fire or retain their structural integrity, or both, dependent upon the type of assembly involved, during a predetermined test exposure. The test evaluates the assembly's resistance to heat, and in some instances to a hose stream, while carrying an applied load, if the assembly is load bearing. The results of these tests are one factor in assessing predicted fire performance of building construction and assemblies. 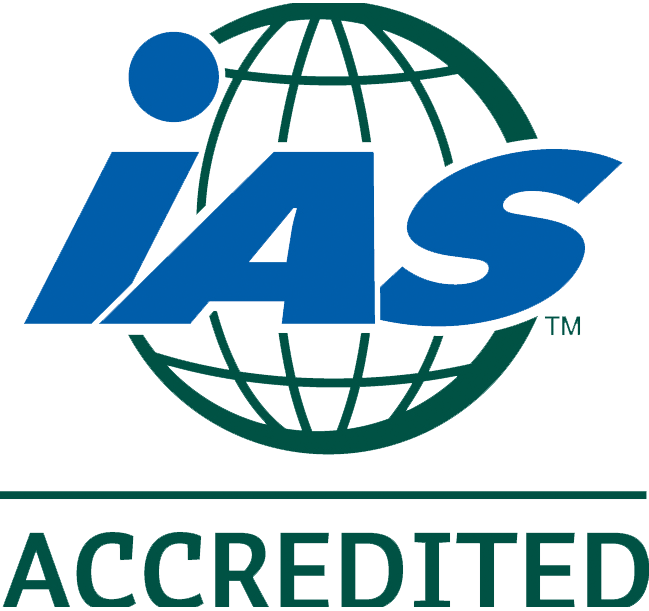 Western Fire Center, Inc. (WFCi) is accredited under the International Accreditation Service (IAS) Acceptance Criteria for Laboratory Accreditation (TL #180). This accreditation encompasses the requirements of ISO/IEC 17025 and relevant requirements of the ISO 9000 series of standards. This accreditation gives our clients confidence that we follow the highest standards in testing and quality procedures. Our knowledgeable staff has 20 years of experience in the fire testing and certification business. E119, E814, ISO 834, NFPA 251, UBC 26-2, UBC 7-1, UBC 7-5 These standards outline methods of fire tests for the fire-resistive properties of building constructions and materials and through-penetration fire stops of various materials and construction. These fire tests are applicable to assemblies of masonry units and to composite assemblies of structural materials for buildings, including bearing and other walls and partitions, columns, girders, beams, slabs, and composite slab and beam assemblies for floors and roofs. They are also applicable to other assemblies and structural units that constitute permanent integral parts of a finished building. These requirements are intended to evaluate the length of time that these types of assemblies will contain a fire or retain their structural integrity, or both, dependent upon the type of assembly involved, during a predetermined test exposure. The test evaluates the assembly's resistance to heat, and in some instances to a hose stream, while carrying an applied load, if the assembly is load bearing. The results of these tests are one factor in assessing predicted fire performance of building construction and assemblies. This furnace is used to test fire resistance for floor/ceiling assemblies in accordance with test standards (most notably ASTM E119). The furnace is 7 feet deep and with collar can be expanded to test columns. It will accommodated samples up to 14 feet wide by 18 feet long. The furnace utilizes unique burners which produce lazy, yellow diffusion flames like earlier furnaces which generated historical fire resistance data. It is able to do so even when run at positive pressure all the way to the floor if desired. This furnace is used to test fire resistance for wall, door, and window assemblies in accordance with test standards (most notably ASTM E119). The furnace is a large-scale, fire-burning apparatus fueled by natural gas. The furnace is mounted to the floor, with the back side close to the west wall, at the south end of the laboratory facility. Inside the laboratory to the north of the furnace is a large area for specimen construction and curing. Ambient temperature in the laboratory is controlled by natural gas radiant heaters at the ceiling level. A wall section can be mounted, in a vertical orientation, into a steel frame specimen holder. The specimen holder is then rolled up to the furnace and secured by four pneumatic rams to the furnace opening. Combustion air and natural gas are supplied to burners through a series of pipes and valves. Internal furnace pressure is controlled by a series of dampers in the exhaust outlets. Temperature measurements are recorded by calibrated data acquisition units which pass the readings to a computer for graphical display and storage. A large roll up door is in the wall opposite the furnace area and allows for the samples to be moved approximately 40' on tracks outdoors to the area designated for hose stream testing. This furnace is used for horizontal research-scale fire resistance tests of building constructions and materials, such as horizontal floor and deck assemblies, thermal barriers (in accordance with UBC 26-2 and ASTM E119) and floor and ceiling fire stops is a small-scale fire burning apparatus, fueled by natural gas. The sample is mounted on to the top of the furnace horizontally. The exposed surface is subjected to the time-temperature curve, while temperature measurements are taken from the unexposed surface, using a computerized data acquisition system. The furnace valves are controlled based upon the average of the interior furnace temperature, which is determined from the internal thermocouples. Additional thermocouples are added to the unexposed surface of the specimen to monitor its temperature. The furnace used in the for vertical pilot-scale fire resistance tests of building constructions and materials and fire door and window assemblies is a small-scale fire burning apparatus, fueled by natural gas. The test assembly is mounted onto a steel frame specimen holder and installed onto the furnace vertically. The exposed surface is subjected to the time-temperature curve, with temperature measurements taken on the unexposed surface of the door and frame using thermocouples connected to a computerized data acquisition system. The furnace valves are controlled based upon the average of the interior furnace temperature that is determined from five internal thermocouples. E152, E2010, E2074, NFPA 252, NFPA 257, UBC 7-2, UBC 7-4, UL 10B, UL 10C, UL 9 These fire-test-response standards are applicable to door and window assemblies, including glass block and other light-transmitting assemblies, for use in walls to retard the passage of fire. These standards determine the ability of door and window assemblies to function as a fire-resistive barrier during a standard fire endurance test. They are intended to evaluate the ability of the assembly to remain in an opening during a predetermined test exposure, which, when required, is then followed by the application of a hose stream. Door and window assemblies are tested for fire resistance using the same furnaces as typical building materials. ASTM E108, NFPA 256, UBC 15-2, UL 790 The test standard examines the performance of roof-covering materials when exposed to fire originating from sources outside a building on which the coverings may be installed. It is applicable to roof coverings intended for installation on either combustible or noncombustible decks when the roof coverings are applied as intended. The following test methods are included in this standard: the intermittent flame exposure test, the spread of flame test, the burning brand test, the flying brand test, and the rain test. Three classes of fire test exposure are described in this standard. Class A roofing assemblies are effective against severe fire test exposures. Under such exposures, roofing assemblies of this class are not readily flammable, afford a fairly high degree of fire protection to the roof deck, do not slip from position, and are expected not to produce flying brands. Class B roofing assemblies are held to the same standards as Class A, but are exposed to moderate flame, Class C roofing assemblies are exposed to light flame. ASTM D2898, AC 107 These test methods cover the durability of a fire-retardant treatment of wood under exposure to accelerated weathering. It is intended that fire-retardant treatment of the specimen be by pressure impregnation, rather than being simply by a surface coating with or without a protective layer. Two conditioning methods are described, both suitable for application to a test specimen prior to subjecting that specimen to an appropriate fire test. These methods are applicable to treated wood products or assemblies thereof. The test specimens will be in the form of, or suitable for fabrication into, fire test specimens, such as those described in Test Methods E84, E108, and E286. ISO 9705, NFPA 265, NFPA 286, UBC 26-3, UBC 8-2, UL 1715 These standards detail test methods to evaluate the burning characteristics and contribution to fire growth of building assemblies when exposed to fire conditions in a standard room configuration. These procedures can test wall or ceiling assemblies of foam plastic, textile materials, or interior finish materials. Either a gas burner or a 30 lb wood crib, excelsior, and ethanol are used as the sources of ignition and burned to test the fire resistance of the wall or ceiling assemblies. E1537, E1590, TB 116, TB 117, TB 121, TB 129, TB 133, NFPA 266, NFPA 267, UL 1056, UL 1895 These test methods are used to determine heat release, smoke density, weight loss, generation of carbon monoxide, and other ignition properties of upholstered furniture and mattresses. They determine performance of these samples when exposed to a flaming ignition source. This performance data has been found to be useful in assessing the fire hazard of upholstered furniture and mattresses in public occupancies. CSFM 12-7A-1, CSFM 12-7A-2, CSFM 12-7A-3, CSFM 12-7A-4 The state of California has recently developed testing standards and code requirements to help protect structures at the urban-wildland interface, which may be threatened by various methods of ignition such as direct flame or brands. These standards expose building sections such as exterior walls, windows, eaves and soffits, and decking materials to fire conditions. Acceptable materials can be qualified for California’s Building Material List. WFCi has been involved in the early development and approval of the standards.